Dennis Kneale, who is a lead anchor on CNBC and has his own television shown, announced to the world this week that the recession is now over. He announced that we will look back 12 months from now to realize that this is the exact bottom and the country will begin a major new growth period from here. He is not alone. Countless commentators on television, online, and in the papers have pronounced the end to this downturn. The vast majority of these people make their living based on the American public buying stocks from them for fees. They feed their children on the hope that America will believe it is time to buy stocks. - Housing continues to turn down on all fronts and many indicators show that we are closer to the peak in housing prices than the bottom. - Unemployment continues to climb at an astonishing rate. This numbers released this morning were a surprise to the downside. - Bank's balance sheets continue to crumble across the board as the debt based economy deteriorates. - Our economy that is based on consumption now has a new motto: "Save your money and pay off debts." This is already having devastating impacts across the board. Over the past 30 plus years we have built an economy based on consumers and businesses borrowing money to spend. 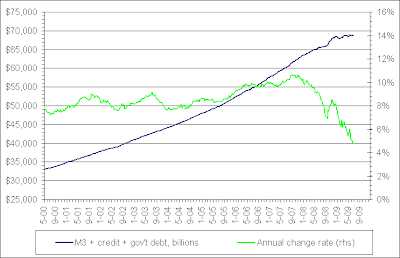 In October of 2007 we reached maximum capacity for debt. Most homes and businesses had borrowed not only enough for themselves, but enough for a few generations to pay off. However, since that point we have had two new entities enter the market to fill the void. The Federal Government and the Federal Reserve. If it is not possible for the American public to borrow any more money and spend, then they have promised to do it for us. The US dollar now stands alone to carry this burden, lets hope he has the strength of mighty Atlas.